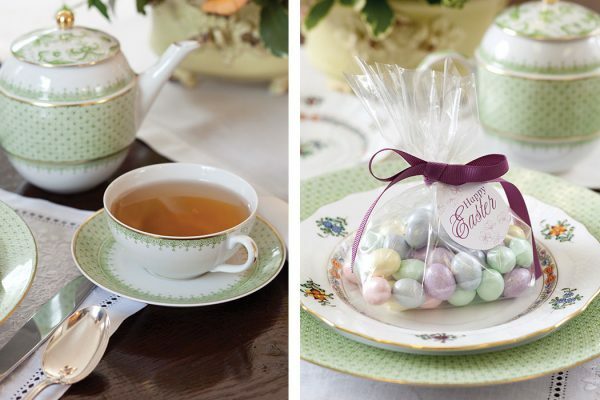 With Easter just around the corner, what better way to prepare for Sunday afternoon get-togethers than a light snack and tea menu from our lovely TeaTime magazine? Easter is a time for rejoicing. Our simple but elegant menu—featuring traditional favorites such as deviled eggs, ham and cucumber tea sandwiches, and chocolate—is sure to enchant your guests on this special day. 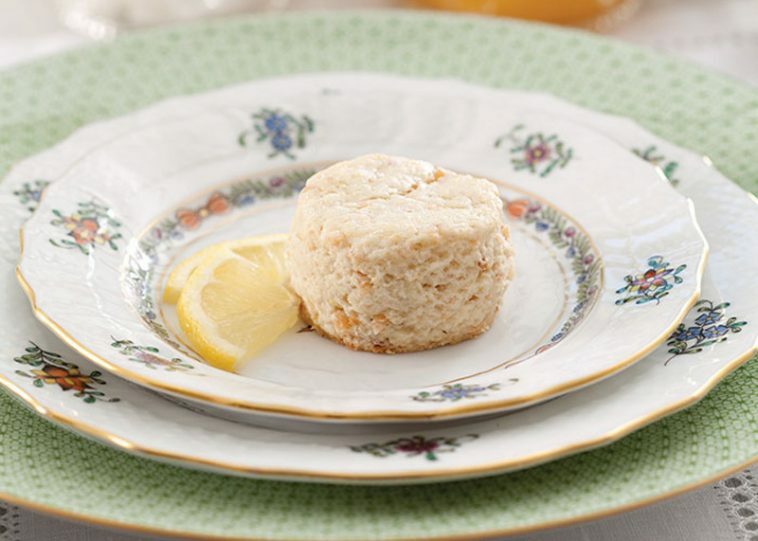 Lemon-Coconut Scones, accompanied by a pot of Organic Hawaiian Passion from Capital Teas, are a lovely way to start our Easter tea. These light and flaky scones make us ready for springtime. Line 2 rimmed baking sheets with parchment paper. Set aside. In the work bowl of a food processor, pulse coconut until coarsely chopped. Spread coconut on a prepared baking sheet. Toast until light golden brown, approximately 5 minutes. Let cool. In a large bowl, combine flour, sugar, lemon zest, baking powder, and salt, whisking well. Using a pastry blender, cut butter into flour mixture until mixture resembles coarse crumbs. Add cooled coconut, stirring to combine. Set aside. In a liquid measuring cup, combine ¾ cup plus 2 tablespoons cream and lemon extract, stirring until blended. Add to flour mixture, stirring until mixture comes together. (If dough seems dry, add more cream, 1 tablespoon at a time, until dough is uniformly moist.) Working gently, bring mixture together with hands until a dough forms. Turn dough out onto a lightly floured surface, and knead lightly 4 to 5 times. Using a rolling pin, roll dough to a ¾-inch thickness. Using a 1¾-inch round cutter, cut 17 scones from dough, rerolling scraps as necessary. Place scones 2 inches apart on remaining prepared baking sheet. Brush tops of scones with remaining 1 tablespoon cream. Bake until edges of scones are golden brown and a wooden pick inserted in the centers comes out clean, 17 to 18 minutes. Brew a pot of Thai Lemongrass Oolong from Capital Teas for the savories course, which includes Caper Deviled Eggs, Ham, Pineapple, and Cucumber Sandwiches, and Radish-Dill Canapés. The sweets course begins with a steaming cup of Chesapeake Sunrise from Capital Teas. Pair this fine tea with our Chocolate Flower Cups garnished with edible flowers from Gourmet Sweet Botanicals. 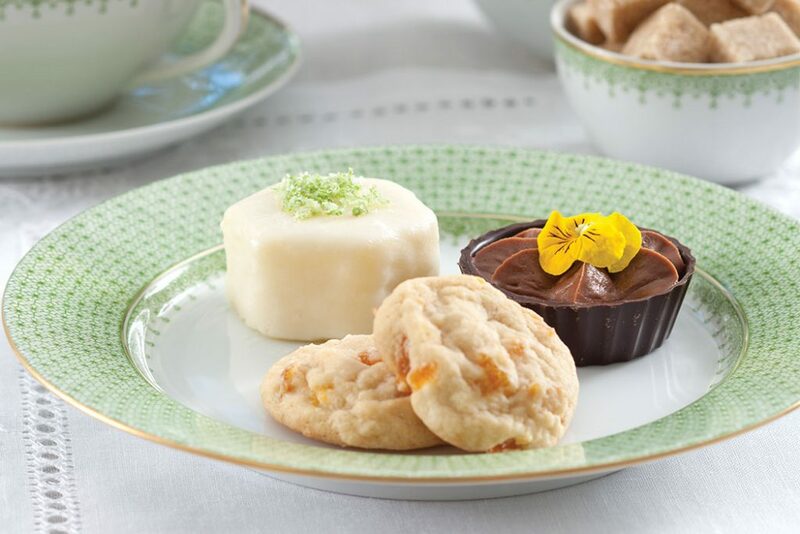 White Chocolate–Apricot Butter Cookies and Lime Petits Fours make a sweet finish to your Easter tea. Herend Windsor Garden dessert plate, bread, and butter plate from Herend USA. Mottahedeh Apple Lace dinner plate and tea for two from Mottahedeh. Towle King Richard sterling flatware 5-piece place setting from Macy’s. Fino Lino napkins and place mats from Bromberg’s. Asparagus bowl from Annieglass. Herend Windsor Garden creamer from Herend USA. Egg tray and glass serving tray from private collection. Love the spring green tablescape. You always inspire me..
For years I have loved the Good Friday services and then the the wonderful celebration of Esater, Resurrection Sunday. Then we have a family meal that, for some reason, always includes pie. One cherished memory from childhood years is that my mother would sew matching outfits for me and my siblings to wear Easter morning. Sometimes we girls would also wear hats. This would seem like the beginning of Spring, especially if we wore white shoes. Easter Sonrise services are often the center of our Easter celebration. Easter is such a special day in so many ways – especially when it falls on April 1st for me! May Easter be a special time for each of our Ribbon Family! I love to greet the sunrise on Easter morning with meditation followed by a cup of tea and a hot cross bun. After services we usually have a small family dinner with ham and mashed potatoes and whatever vegetables are in season and look good. Dessert is something lemony. This year I am making a lemon cornmeal bundt cake to be served with vanilla ice cream. When it comes to the chocolate bunny the ears are always first! What a gorgeous presentation! I love any scone and the lemon-coconut looks perfect. Easter is a special time for our family as we celebrate the resurrection of Christ! That Easter display is a joy and so elegant. We fill our baskets with candy. I have Peeps only because I an allergic to chocolate. I guess even adults enjoy baskets filled with Easter candy. Thank You for this post. Everything looks so pretty. We color eggs and on the Saturday before Easter. I love your display. It is so colorful. We lie to fill individual baskets with books. The books do not have to be Easter themed. We also put other small articles in the baskets ,too. 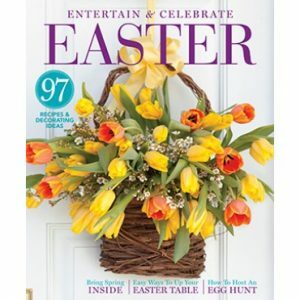 My favourite Easter tradition is blessing baskets filled with a sampling of next day’s Easter brunch food…always included in the basket are dyed cooked eggs, decorative Ukrainian pysanky eggs, an Easter paska or babka bread . Once the candles are lit, the priest walks around and blesses all the baskets with holy water. Then everyone sings, Christ Has Risen! Another tradition in our family was the annual chocolate egg from our local patisserie. Each egg was wrapped in beautifully coloured foil, tied with a ribbon. Inside there were chocolate truffles surrounded by a “nest” made of crinkled green paper strips. This is a a tradition I continued with my own son but sadly the bakery no longer exists, but the memories will last a lifetime. That is such a pretty plateful of goodies. I love the chocolate cup with a flower on top! My head spins when I walk down the street before Easter. Already the chocolatiers’ windows are full of gorgeous creations. Almost too pretty to eat. Almost.